Sorry this item is currently out of stock! Contact us for Back Orders. 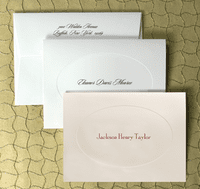 Choose a Name or Monogram for your personalization at the top of the note. If purchasing returned addressed envelopes use second Personalization box for street address and use the third for city, state, and zip code. Addressed envelopes are an additional $10.00. Folded Size: 5.75" x 3.875"
Please enlarge image to view the avaliable fonts. Rytex can drop ship directly to any shipping address you provide. No gift wrapping available.